Some websites and servers restrict VPN use. In these cases, you need to use your physical IP address. Rather than disabling your VPN every time you want to access these sites, you can set up a permanent VPN bypass so your physical IP address is used automatically. To set up a VPN bypass route, first you need to locate your Gateway IP address and the IP address of the website you want to access using the VPN bypass route. Disconnect SecureLine VPN before following the instructions in this article. In the Command Prompt window, type route print and press Enter. 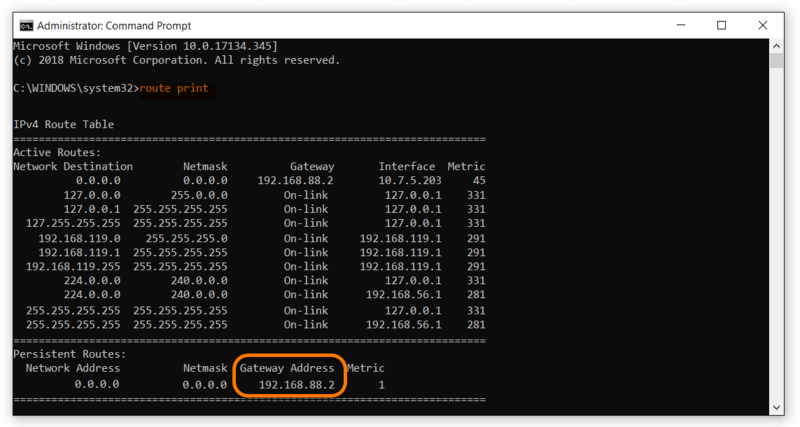 In the IPv4 Route Table output you can find your Gateway IP address under Gateway Address. Take note of this number. From the top menu bar, select Go ▸ Utilities, then open Terminal. In the Terminal window, type netstat -r and press Enter. 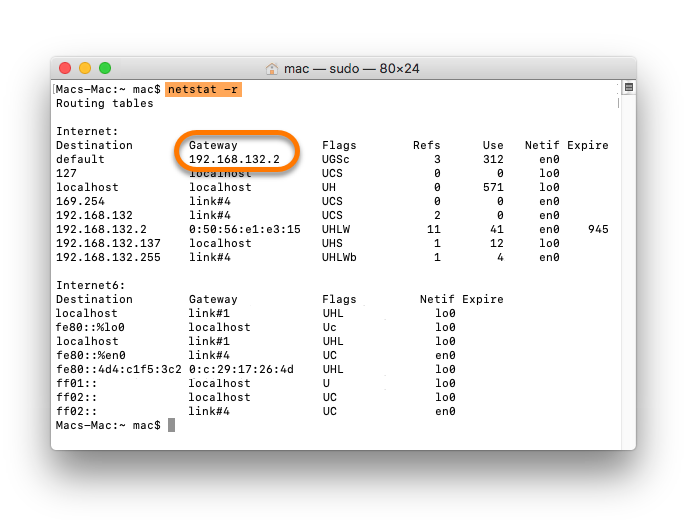 In the output you can find your Gateway IP address under Gateway. Take note of this number. In the Command Prompt window, type ping followed by the URL of the website you want to set up the VPN bypass for. 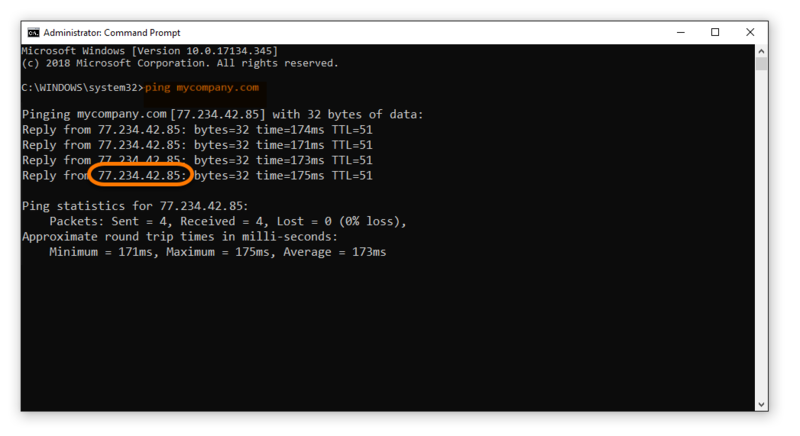 For example, to find the IP address of the website www.mycompany.com you would type ping mycompany.com into the Command Prompt window and press Enter. 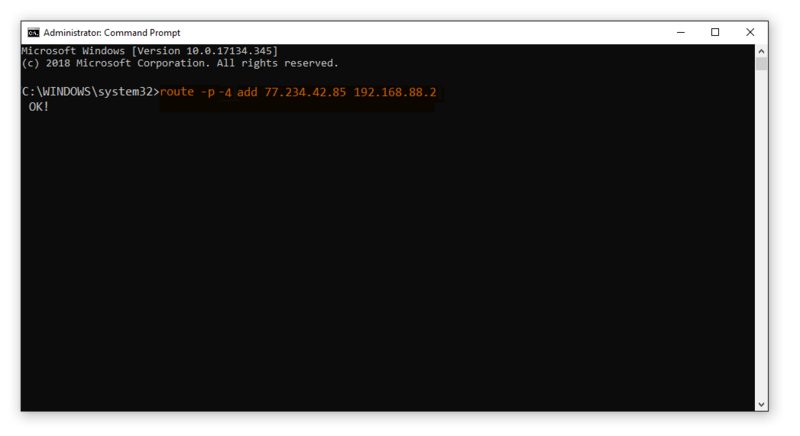 In the Command Prompt window you can now see the IP address of the website. Take note of this number. Type ping -c 4 followed by the URL of the website you want to set up the VPN bypass for. For example, to find the IP address of the website www.mycompany.com you would type ping -c 4 mycompany.com into the Terminal window and press Enter. 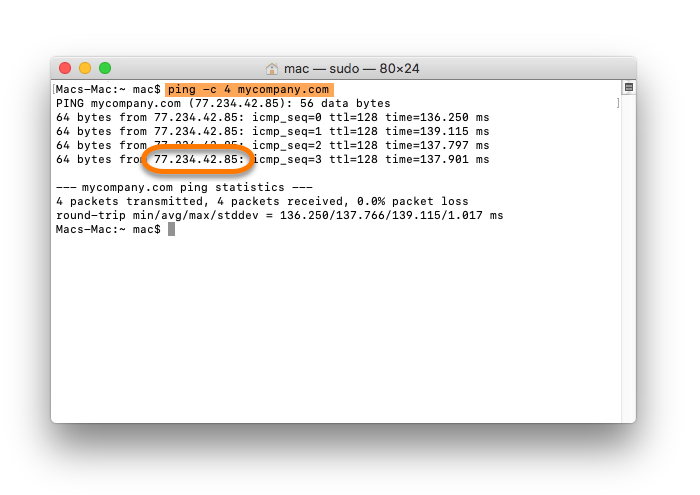 In the Terminal window you can now see the IP address of the website. Take note of this number. You can access certain VPN restrictive websites or servers by manually setting up a VPN bypass route. You will need to know your Gateway IP address and the IP address of the website you want to bypass. Click the Windows start icon and type cmd. Select and right-click Command Prompt from the search results, then click Run as administrator. In the Command Prompt window, type route -p -4 add followed by the IP address of the website and then your Gateway IP address. For example, route -p add -4 77.234.42.85 192.168.88.2 where 77.234.42.85 is the IP address of the website you want to access and 192.168.88.2 is your Gateway IP address. If you want to set up a temporary bypass route, remove -p from the route string. Press Enter to activate the routing. The bypass route is set up. You can now connect your VPN again and you should be able to access the previously blocked website. Before following the instructions below, ensure you are logged in with an administrator account that has a password. 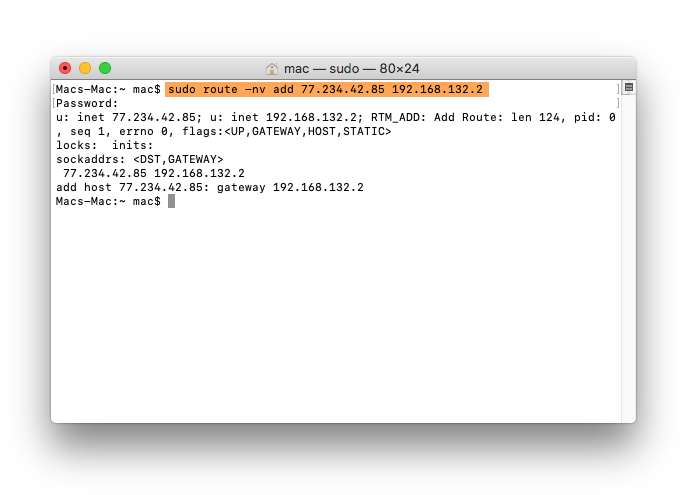 Type sudo route -nv add followed by the IP address of the website and then your Gateway IP address. For example, sudo route -nv add 77.234.42.85 192.168.132.2 where 77.234.42.85 is the IP address of the website you want to access and 192.168.132.2 is your Gateway IP address. Terminal prompts you for your password. Type your password and press Enter. The cursor in the Terminal window will not move when you type in your password. If the steps above do not work or your bypass route stops working, we recommend you contact the administrator of the website or server you are trying to access. It is possible that the website or server has more than one IP address. In this case you will need to repeat the steps above for each IP address.